Wow I haven’t posted in over a month. A lot of things have changed. Anyway, here is a possible beginning to my latest sappy love story. First draft. Very rough. Please forgive. James’ truck lights bounce off curls of steam rising from the hot asphalt. I’d asked him to take me to the river so we could watch the heat lightning dance out over the Neuse. His tires make a hissing sound on the wet road and the windshield wipers squeak across the glass every now and then. James ignores me. I reach over to push up on the lever that controls the wipers and he swats my hand away. We never really talk much in the car. I look over at him every once in a while and scratch the place where his hair meets the back of his neck with my fingernails. He rests his hand on my leg and drums his fingers along with the music. James’ tires kick up gravel when we pull up to the clearing and it’s the only sound in the world. He slams his door when he gets out and it makes me jump. I look around. I feel as if all the air might just fall down around me. It’s so thick. The evening rain has not cooled or thinned it. The gravel is warm and slippery beneath my bare feet. We walk slowly through the trees. Spider webs shine as James’ flashlight passes over them. Stray drops of water from sagging tree leaves fall and break on my shoulders. Summer night clings to my skin. We get to our picnic table, the place we always come, and spread a blanket out over the top of it. James grabs one end, swiveling it so that it faces directly out over the boat ramp and into the darkness hovering over the water. If there is a moon it is hidden by clouds. Big clouds. The storm has moved off to the east and from the clearing where we sit I can look up and see stars. Thunder still booms idle threats from the horizon. I look out to the east, following the clouds. Sporadic sheets of purple and pink and white illuminate the sky as the heat lightning flashes. “I love that,” James says. He is staring off at the same place I am. 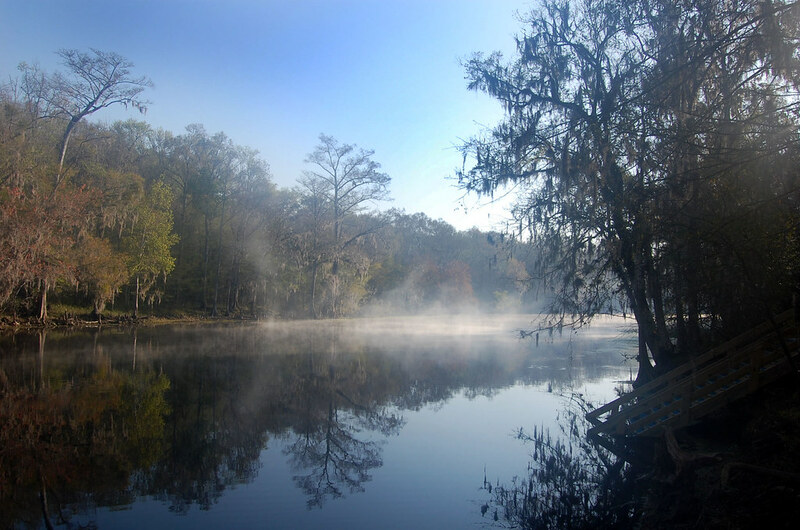 And a picture of Ginnie Springs, Florida to accompany.